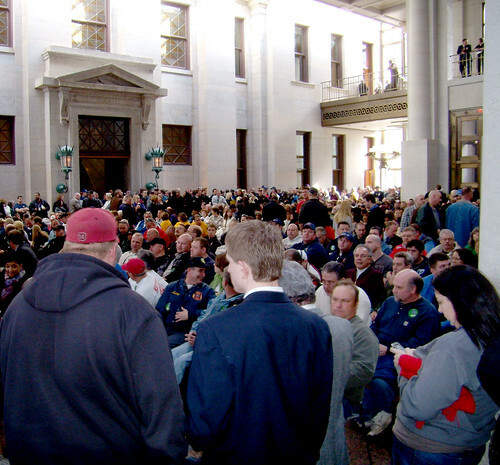 CWA members and thousands of other workers packed into Ohio's statehouse for hearings on anti-worker legislation. For the second week, thousands of people are jamming Ohio's statehouse to protest legislation that would wipe out collective bargaining rights for state employees, weaken other workers' rights and have a devastating ripple effect on families and communities already struggling financially. "There had to be at least 3,000 people there Tuesday," said Diane Bailey, vice president of CWA Local 4310 and president of the CWA State Council in Ohio. "Rooms everywhere were filled up. They had to put chairs in the atrium, in the rotunda." Audio of the hearing was piped into the overflow rooms. Unions and other opponents get a chance to testify today, but Tuesday's hearing was for supporters of the anti-worker legislation. "They gave us a warning about the booing getting out of hand, but I think it was very well ignored," Bailey said. "People are angry." CWA members are also making their case in the media, from Facebook and Twitter to newspaper columns and letters. "Eliminating front-line workers and civil servants who provide critical services to the public will not provide the solution promised. Often it is a promise of future prosperity that never materializes but instead results in less service and accountability to the taxpayers," CWA Local 4502 President Brien Bellous wrote in a Cleveland Plain Dealer op-ed Feb. 13. Union members aren't alone in the fight. Allies from small groups of concerned neighbors to large churches to the full slate of social justice and environmental activists have formed a coalition to stop Gov. John Kasich's attacks on workers and the GOP's broad agenda to slash jobs and public services. The coalition, "Stand Up for Ohio: Good Jobs and Strong Communities," was started by CWA District 4 Vice President Seth Rosen. In the first 12 hours after its debut this week, 25,000 people friended its Facebook page and the number has more than doubled in size since. Coalition members will use their collective, grassroots power to help each other fight for issues critical to workers, families and strong, safe communities. They are planning major street demonstrations at least three times in the next six months in cities across the state, with the first series of events March 15. "The politicians have a strategy of divide and conquer," District 4 Vice President Seth Rosen said. "Our strategy is unite and win." Workers united not only in Ohio this week but at enormous rallies in Wisconsin. "As anyone who was present in Madison or Columbus could tell you, this is what the beginning of a mass movement looks like," Rosen said. "The energy, unity and commitment of workers from both private and public sectors, as well as people outside unions, was evident to all. We will continue to grow and build a broader coalition over the weeks ahead because this fight is far from over."